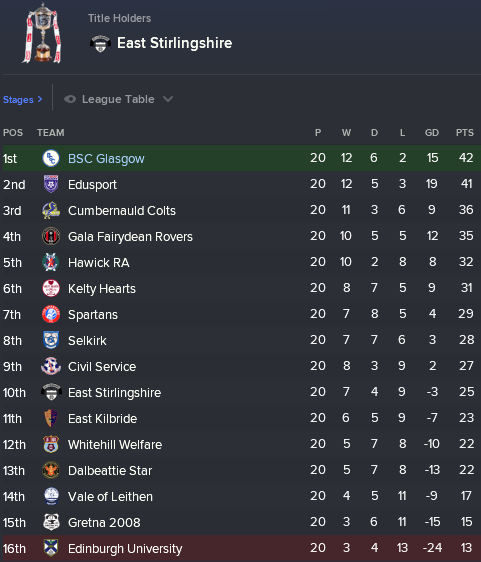 It just so happens that one of our local rivals decided to follow this path, and asked yours truly to jump from the good ship BSC Glasgow. Sorry East Kilbride, I still have unfinished business at the Indodrill! As you join me again, the transfer window is about to slam shut. We have managed to make a couple of additions, but ideally I need to make a “statement” signing in the waning hours – no, not just to get on Sky Sports News… we’re going all the way to the bitter end in this title battle, and more quality is needed to push this group over the line. Our unbeaten record has gone, and with it a bit of the squad’s confidence, but a new known face could bring back the collective spring in our step. Touch wood, we’re still relatively injury-free, with the exception of recent arrival Callum Hendry up front. Young Callum is already on first name terms with the physio, and realising this forced me to seek another hitman along with a bustling midfielder; enter ex-Kelty Hearts forward Jordan Moore and ex-Clyde ball winning enforcer Barry Cuddihy. Both players have already earned themselves a starting berth, and Moore in particular is contributing hugely with a return of four goals in 5 appearances thus far. Losing our club-record unbeaten run against Spartans was especially hard to take given that our old friend Tom Bentham put us to the sword. Sitting a goal down with ten minutes remaining, we threw caution to the wind and were hit by two sucker punches on the break. My disappointment was two-fold – the Ainslie Park side, in winning, salvaged their own title challenge. Just four days later, I stood in the dressing room under severe pressure as Civil Service Strollers put us in 2-0 down at the break… fortunately for everyone watching (mostly me! ), we made some changes up top and somehow turned things round to win 3-2! As fantastic a turnaround as it was, our weaknesses have now been exposed for all the other sides in the competition to see: playing five men in midfield can stifle our creativity, and we are then vulnerable to long balls over the top as we press further forward. I’ll now need to work on a tactical tweak or two with my team having managed to improve our play at the other end of the pitch: big ‘Paolo’ Grehan has gradually morphed from starter to substitute, paving the way for our more mobile new man Moore to claim his spot. Thankfully, most interest in our talented young players has not amounted to concrete offers. Dale Baxter is currently considering a move to SPFL side Stranraer, while Max Oulaitoh has captured Elgin City’s attention. Rumours abound of late interest in our crown jewel Aaron Morrison, and I spotted Ayr United manager Ian McCall watching him in our last game at the Indodrill. Whatever happens, I cannot allow him to leave with another year left to run on his youth contract. Edusport Academy are keeping up the pressure as we reach the final 10 league fixtures of the 2019/20 season, but others below cannot be counted out just yet. We need to ensure that our rivals don’t out-do us in the dying moments of this transfer window – I’ve played slightly dirty in trying to steal a young centre back from under the Academy’s nose, and they haven’t reacted too well! Either way, I feel that we badly need a quality defender to come in and stabilise things for the last few months of our Lowland title push. The next time we meet, It’ll likely be apparent if we are champions in waiting or fold under the pressure of the chase. Our young group haven’t failed us yet, so I’m placing my hope in the innocence of youth… maybe they won’t notice all the attention? The “playoff” word will remain banned in the meantime!